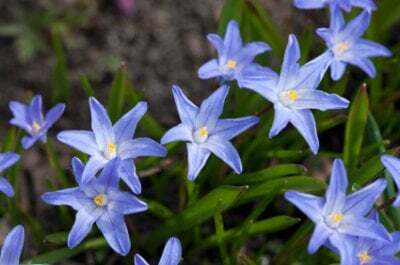 Glory of the Snow (Chionodoxa) will grow towards the end of winter, or in the beginning of spring. It really depends on the climate and the region. This is an outdoors plant that can grow anywhere you like. You can grow them in a garden, under the trees, or even as a border plant. Take your pick! I myself would like to use them as a border plant. If you live in an area with a cooler summer climate, then you want to plant the flower bulbs in a spot with full sun. If your area has hotter summers, then plant the bulbs where they will have some shade. To start growing Chionodoxa plant the bulbs about 3 inches deep in soil that is well drained. You can begin planting the bulbs in the autumn months. Space each bulb 2 to 3 inches apart. If you do not get much rainfall in your area, you will want to water the plant regularly. Once you see the foliage on the plants beginning to die off, you do not need to water them as often. Once the plant starts to grow, you will see lots of small star shaped petals. The petals do not grow close together and that is what gives the plant its star like shape. This is a self-seeding plant and it will grow and spread like wild fire. When it starts to spread out too much, dig up bulbs, after the plant is done growing for the year, and replant the bulbs in another area: preferably in autumn. This plant does not offer too many colors. They usually only grow to be white, pink or blue.